The President’s Emergency Plan for AIDS Relief (PEPFAR) has solidified its partnership with the media in Lesotho in the fight against HIV and AIDS. 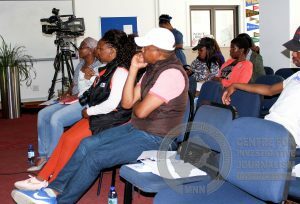 A one-day media session organised by the MNN Centre for Investigative Journalism at the American Corner, State Library in Maseru on Friday, saw relations between the PEPFAR team and media practitioners in the country strengthened. The session, meant to underscore the role played by media in the fight against HIV/AIDS, was attended by 30 local journalists. The gathering was also aimed at acquainting journalists with the American-origin programme, PEPFAR, and harmonise working relations between the two parties for improved response against the pandemic. PEPFAR is a global initiative started by United States former President, George Bush in 2003 in response to the global HIV/AIDS crisis. 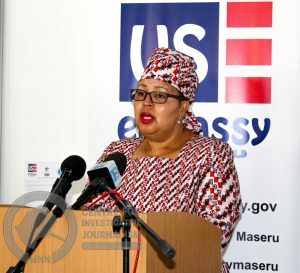 Speaking at the occasion, the US Ambassador to Lesotho Rebecca Gonzales said the partnership’s goal between PEPFAR and the media was to deepen the discourse on HIV/AIDS. The partnership, Gonzales explained, was further meant to increase understanding of relevant issues and ultimately help ensure the country turns tide on the epidemic sooner rather than later. “2018 marks 15 years of the United States global commitment to fight HIV/AIDS epidemic through PEPFAR and 10 years of support to reversing the epidemic here in Lesotho. 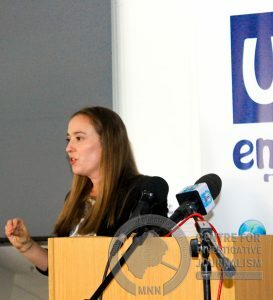 “Our partnership with the Centre for Investigative Journalism and all media partners is an opportunity to increase the availability of life-saving information to the public,” said the Ambassador. Gonzales added the influence of the media and its power to do good helped PEPFAR to achieve the epidemic’s control. Since its inception PEPFAR has now saved lives of nearly 14 million people in the sub-Saharan Africa region through its various programs that includes: provision of Anti-Retro Viral Treatment, Prevention of Mother to Child Transmission treatment, Voluntary Medical Male Circumcision, Pre-Exposure Prophylaxis, Post-Exposure Prophylaxis and other. For her part, Deputy Health Minister, ’Manthabiseng Phohleli (pictured), commended PEPFAR for being government’s major part in the fight against HIV/AIDS. “Through the PEPFAR’s DREAMS (Determined, Resilient, Empowered, AIDS-free, Mentored, and Safe) public-private partnership, the government has implemented the Men’s Clinic, Voluntary Medical Male Circumcision (VMMC), Index testing and adolescents and young people’s friendly services across 10 districts of Lesotho. “As the government our key priority is universal health coverage,” she confirmed. Phohleli said the country is now poised to achieve epidemic control by 2020 as it has nearly gained control of its HIV epidemic. She further adds through the household-based national survey of November 2016 to May 2017 called Lesotho Population-Based HIV Impact Assessment (LePHIA) conducted by the Centre for Disease Control, in order to measure the status of Lesotho’s national HIV response to UNAIDS 90-90-90 targets for all ages, genders, and at-risk groups the country scored 1st 90= 70% , 2nd 90= 90% 3rd 88%, breaking down the barriers that prevent people from accessing lifesaving HIV services. The Deputy Minister said government is further determined to build bridges by leveraging the power of partnerships, working together to accelerate progress and promote long-term sustainability of HIV/AIDS response to reach 95-95-95 targets. Phohleli is also confident Lesotho will eventually reach the 100 percent epidemic control. She commended the media for holding government accountable by reporting on various government initiatives and progress on such initiatives. According to PEPFAR Lesotho Coordinator Aubrey Casey over 200 000 Basotho are on HIV treatment and almost 80 000 HIV pregnant Basotho women are receiving treatment to reduce the risk of mother-to-child transmission. She also adds that to date 3.8 million HIV tests have been made in Lesotho but explaining the 3.8 million that seems be far off the mark in a population of 2.2 million people the high number is as result of multiple testing by one person at different testing places in a period of less than 3 months. Amid financial set-backs, media in Lesotho has been resilient and covered developmental stories and to even report more on health issues in the future, Advocate Monaheng Rasekoai has urged government to motivate the media fraternity. This, Rasekoai said would help the media report more on HIV/AIDS issues and also to demystify myths and stigma that consumers of news are not keen on following issues related to the pandemic. Journalist also expressed concerns on restrictions imposed by Christian media houses which prohibits journalists working for them to provide audience and or readership with information about birth control related issues and treatments. Talking about latest results of the country’s HIV/AIDS response, Casey said PEPFAR is proud to highlight the country’s latest results “which show the historic impact of their transparent, accountable, and cost-effective investments in rapidly accelerating HIV prevention and treatment efforts which will be shown at this year’s worlds AIDS day commemoration at the 1st of December. Casey also notes the media remains an important partner in the sensitization of society on HIV/AIDS related issue.